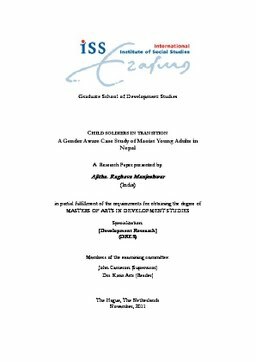 This short research paper is an attempt to explore the involvement of girls in the Nepal Maoist war, the push factor, and their empowerment during their association with the Maoist. It also looks at the rights perspective and the conscious decisions taken by the young combatants to join the Maoist to fight for the cause of equality and justice. Contrary to the common outlook of girl soldiers as victims of forced recruitment, abduction and abuse, the paper looks at the voluntary recruitment as expression of agency in the light of a conflict situation where the systems are not geared towards taking care of their needs and rights. The paper draws on interviews from ex-combatants and NGO/INGO personnel and analyses them to get a understanding of their involvement and their present life post the signing of the peace accord.